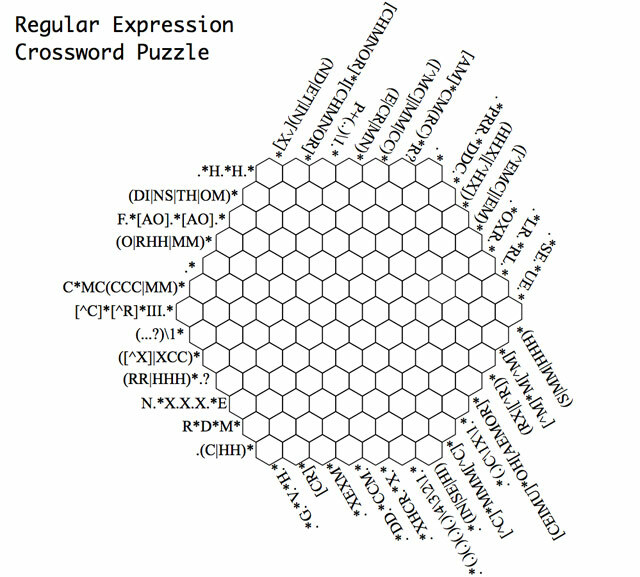 In part 1 of this series I showed the Regular Expression Crossword and talked a little bit about how it works and strategies for solving it. In this part I'll show how I represented the problem space using Haskell. Complete Haskell code for the solver is available on Github. 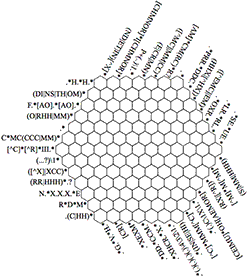 The Regular Expression Crossword consists of hexagons with 3 groups of Regular Expressions, with 3 crossing on each hexagon. The objective of the game is to need to find letters for each space that match all of the expressions. It's made a little harder by wildcards in the expressions that can match anything and by Back References that match previous parts of the expression. My first thought was to use a 2D array and refer to the hexagons by row and column. This kind of works (think of it like a square grid with every other row offset by half a square) but it has 2 problems. The first problem is that you end up with lots of positions in your array that don't match up to a square on the puzzle, but that's not too big a deal. The second problem is how to figure out which Regular Expression matches to which set of positions, have a think about it for a second and I'm sure you'll see it's a problem. 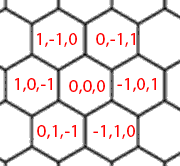 To solve this I turned to Google and quickly found this excellent article on coordinate systems for Hexagonal grids by Chris Schetter. He shows that, as expected, Q*Bert had the solution all along: use 3D coordinates! If we extend the previous 2D coordinate system to also have a third Z coordinate which is is always set to \(-(X + Y)\). As an added bonus if we decide that the centre of the puzzle is \((0,0,0)\) you can find out if a point is within the puzzle by checking that none of the the coordinates has an absolute value greater than 6. You may have spotted (or read in the linked article) that we don't actually need to store one of the coordinates, it just makes everything easier to understand. So we'll only be storing the X and Y coordinates and just generating Z when it's needed. So, finally to some Haskell! First let's define the types we'll be using to represent the puzzle (after importing the required modules). So the Coords type is a pair of Ints and is used to present the coordinates (storing just the X and Y), the Possibilities type is a Set of Characters and the GameState is a Map from Coords to Possibilities. This uses a List Comprehension to generate all the X and Y coordinates between (-6,-6) and (6,6) then discard the ones that aren't valid. For each of the filtered coordinates a entry is made is a Map, we start off with every position containing the full set of letters (we'll narrow it down as the program runs until we get to just one letter per position). Just c -> showCell x y z (Set.toList c) ++ " "
How to actually display the cells is deferred to a function that is passed in, I found the most useful one would display a "." if the all 26 letters were still a possibility, a "*" if it had been narrowed down to less than that or the letter itself if answer has been found for that location. I also set it to display "!" if the set of possibilities had been reduced to none but I never saw that, the bugs manifested in different ways. What we'll mostly now want to do is to match up the regular expressions with the positions on the board that they'll need to match. This code generates the coordinates for each of the 3 groups of Regular Expressions separately then concatenates them all together. We can now have a single dimension array with all the Regular Expressions (first the X side, then the Y side then the Z side) and it will match up with the set of coordinates we've generated. To test it out I wrote a main function that reads in the Regular Expressions from a file, splits them up and filters out any blank lines. It then zips them up with the coordinates generated earlier and prints them all out. Now it's just a matter of narrowing by matching the expressions against the sets of letters in the corresponding lists of coordinates. Tune in next time to hear about the custom Regular Expression engine I wrote to help do that. Stick your email in the box below if you want an email when I add new articles to this site (including the next part). I won't use your email for anything else or let anyone else have it.